Ariele holds her Personal Training Certification through the National Academy of Sports Medicine and has been training and instructing for over two years now. She focuses intently on the individual needs of each of her clients and encourages growth in all areas of life: physical, emotional, mental, and spiritual health. Encouraging the power of positive thinking and personal accountability have been huge aspects of the success of her clients. 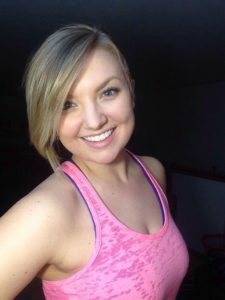 In addition to one-on-one Personal Training, Ariele also leads Small Group Training and Group Fitness Classes including ABC Fit, Dance Fitness, and more. If you are interested in working with Ariele, attending one of her classes, or simply sitting down to discuss your personal health and fitness goals, you can contact her at 614-492-8632!